Clean water equals healthy bird. Just throw it in the dishwasher, right? Wrong. Parakeets need to have their water dishes cleaned daily to avoid the growth of bacteria that could make them sick. No science degree required, but a few precautions are in order. Take a look at the water dish first. Is it stained or dirty? If not, a simple rinse and scrub with a sponge—using only water and just a touch of dish detergent—could be enough to clean it up. You should still wash it more thoroughly at least once a week, but rinsing could be enough from day to day. Use a wool sponge to help you scrub any remaining crust or dirt away. Add more dishwashing soap if you notice dropping or stains on the dish. For more serious stains, run the dish through the dishwasher once in a while. Because the dishwasher uses such hot water, it will help disinfect and sanitize the container. Rinse several times to completely get rid of any soapy residues. When you think all soap is gone, rinse one more time. Then dry the dish well before putting it back into the cage and adding fresh water. Consider switching to a water bottle, which keeps the water safe from droppings and other contaminants that could make your bird sick. Parakeets are smart birds who can easily learn to drink from a water bottle. Having at least two water dishes makes sense. That way you can switch to a clean one in the morning and then spend as much time as necessary cleaning and drying the dirty one so you can use it the next day. Make sure your water dish is not too big or your parakeet might confuse it with a bird bath. Bathing and drinking from the same dish can cause health problems. To prevent this, let your parakeet take daily baths or add a large water bowl to the cage for this. 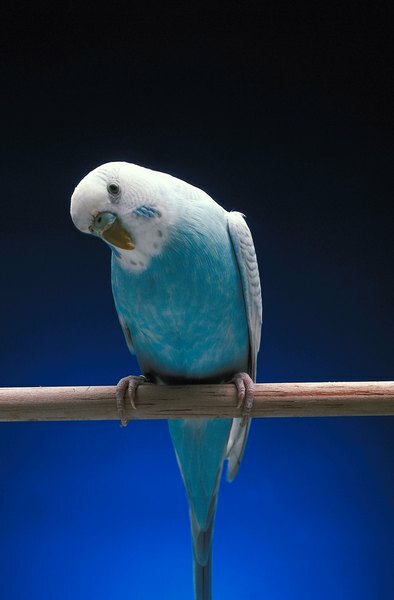 What Causes Parakeets to Die Suddenly?